Beyond the Rave is said to be full of "vampires, death and suspense"
Cult British film company Hammer is to broadcast its latest horror venture on social networking site MySpace. Beyond the Rave, described as Hammer's first horror movie in 30 years, will be shown as 20 'webisodes' in spring 2008 before being released in full on DVD. 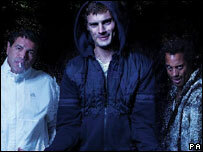 It is billed as a vampire story set in the UK's underground rave scene. "This is a bold venture creating horror for the 21st century through a variety of technologies," said Simon Oakes of Hammer Film Productions. Sadie Frost, Ray Winstone's daughter Lois and horror veteran Ingrid Pitt feature in the cast. Hammer Films was launched in 1934 but enjoyed its greatest success in the 1950s and 60s. Its name became synonymous with the horror genre thanks to such titles as The Curse of Frankenstein, Dracula, and Quatermass and the Pit. "For Hammer to make their first movie in 30 years specifically for the MySpace community is a phenomenal development," said James Fabricant of MySpace Europe. The deal follows Hammer Film Productions' acquisition earlier this year by Dutch consortium Cyrte Investments. The latest Jackass movie will be released on the internet later this month, bypassing US cinemas entirely. The film will be available for no charge on the Blockbuster film rentals website between 19 and 31 December. However, fans will have to pay for the title when it is released on DVD on 26 December. Jackass 2.5 combines unreleased footage from Jackass Number Two and new content.